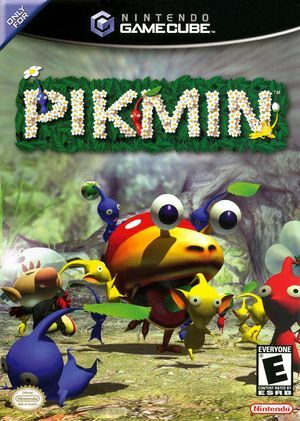 Pikmin may be small and plantlike, but they can be a space traveler's best friend. Stranded on an unknown planet, Captain Olimar must enlist the help of these native Pikmin to rebuild his spaceship before the life-support system runs out. In the meantime, you'll have to fend off attackers and solve various puzzles. To produce additional multicolored Pikmin you must defeat enemies and carry them back to the Pikmin nests called onions. But beware—watching giant predators gobble your Pikmin might make you angrier than you'd expect. Pikmin has various sound and music issues with DSP HLE, DSP LLE corrects these issues. The enemy showcase reel that plays after the credits when you achieve the Happy Ending has minor stuttering with default settings, most noticeable on the scrolling text. Setting Texture Cache Accuracy to Medium resolves the issue. Will sometimes hang on a black screen when the day ends. This mostly happens when using save states on that day. Likely resolved sometime before 4.0-7714. The built-in Widescreen Hack causes clipping and reflection issues. The following Action Replay codes work as a replacement, causing fewer issues. To avoid conflicts, make sure that Widescreen Hack is disabled while using these codes. Enabling this Gecko code on an NTSC-U copy of the game forces it to run at 60 frames per second. 2.0 Windows XP AMD Athlon II x2 215 @ 3.45GHz NVIDIA GeForce 7025 (: Game completed! Sound disappears in intro and some other places. Small slowdowns in huge places. †.fl.l). This page was last edited on 18 November 2018, at 03:07.